Gov. Jay Inslee is the first governor to enter the 2020 presidential race. Washington Gov. 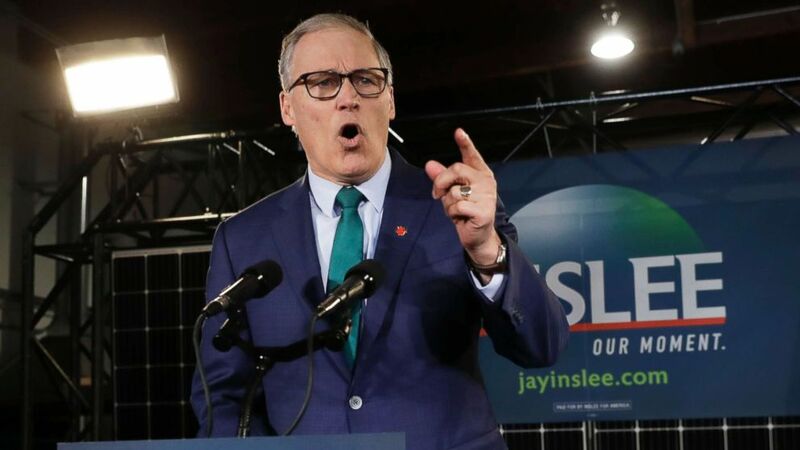 Jay Inslee, who officially launched his presidential campaign on Friday, decried the "enormous cost" the United States will bear if it does not act swiftly to combat the effects of climate change. "You have to understand there is enormous cost of doing nothing here," Inslee said on "This Week" Sunday. "There is a huge cost to our economy, our health and national security if we do not act." When asked by ABC News Chief Anchor George Stephanopoulos about a recent ABC News/Washington Post poll that found combatting climate change to be a lower priority on Democratic voters' minds than issues like healthcare and economic inequality, Inslee said he plans to cast the problem as a "character issue." "Look, I really believe that the way to win this is to talk about the basic American character of who we are. We think big. We go to the moon. We invent. We create. We build. We lead the world, we don't follow it," Inslee said. "I think we have got to argue this from a character standpoint, and an optimistic standpoint, because that's what wins in America, and I truly believe that." When asked about the defeat of a ballot initiative in Washington state that would have instituted a carbon tax, something he campaigned hard for, Inslee said there are multiple ways to implement policies that both combat climate change and promote economic growth. "There’s multiple tools in our toolbox and this is good news, right? It’s good news that we don't have to depend on just one tool," Inslee said. "We now are growing jobs all kinds of sectors because of my clean energy development fund, a $100 million fund that we have. We’re electrifying and put people to work in software, dealing with the integration of batteries, new battery technology." (Ted S. Warren/AP) Washington Governor, Jay Inslee, speaks during a campaign event at in Seattle, March 1, 2019. 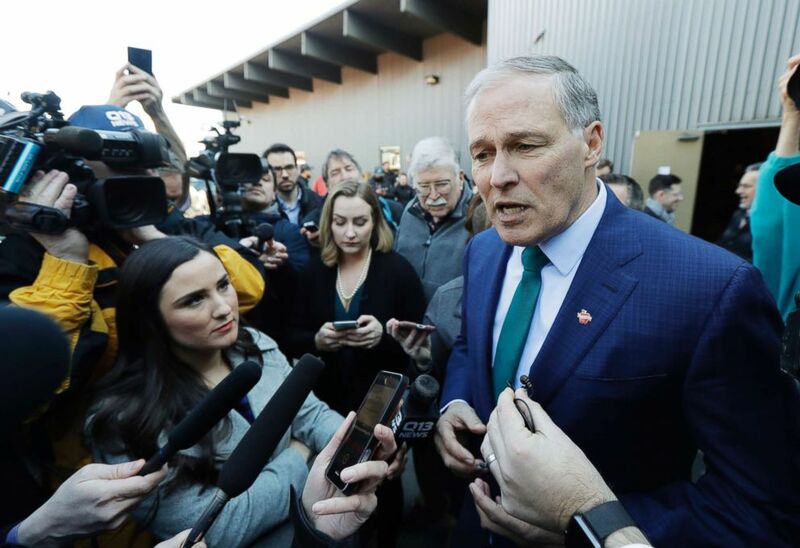 Inslee, emphasized the "existential threat" of climate change to the United States when he announced his candidacy for president Friday morning. He's the first governor to join a field of Democratic contenders that has already swelled to over a dozen candidates. The former congressman, who has co-authored a book on climate change, is betting that a campaign that hinges on a singular issue will help him stand out despite his lack of national name recognition. "Whether we shrink to this challenge or rise to it is the vital question of our time, we have one chance to defeat climate change, and it is right now,” Inslee told a crowd of supporters at his official campaign launch, which took place at a solar energy installation company in Seattle. "It is my belief when you have one chance in life, you take it." (Ted S. Warren/AP) Washington Governor Jay Inslee answers questions from reporters after speaking at a campaign event in Seattle, March 1, 2019. Inslee, 68, spent 2018 as the chair of the Democratic Governors Association, helping the party flip seven seats from red to blue and raising his national profile as an antagonist to President Donald Trump. During an event last year at the White House, Inslee called out the president over a proposal to arm teachers in the wake of the mass shooting at Marjory Stoneman Douglas High School in Parkland, Florida. "I just suggest we need a little less tweeting here, a little more listening," Inslee said at the time. Inslee said he is "comfortable" confronting Trump on a host of issues, and hinted that further legal action against the administration may be forthcoming. "I can think of no higher pleasure than to take on Donald Trump on a big stage. I’ve done it in White House. I’m the governor who went to the White House and told him he needed to quit tweeting and start listening to Americans. I feel very comfortable in that confrontation," Inslee told ABC News in an interview following his campaign launch on Friday. "I’m happy that I was the first governor to call him out on his Muslim ban. We’ve sued him successfully now something like 16 times, and we’ll do it again on his emergency action on his vanity project on the wall, at the right moment." Inslee heads to Iowa on Tuesday, where he will host a number of green energy events during his first trip to the state as a presidential candidate.